It seems a bit strange for me to write about prayer. I don’t identify with any religious group. I don’t pray to any particular God. And I don’t ascribe to any specific prayer rituals (e.g., kneeling, bowing, crossing myself). Instead, I am one of those so-called spiritual people; I feel it strongly, but I don’t fit into any box. To be honest, identifying as ‘spiritual’ is neither easy nor fun (and a bit like identifying as ‘queer’). People are adverse to ambiguity. And when you add ambiguity to spirituality (which is already an internal, nebulous topic) it becomes that much tougher. Because even though I’m spiritual, I pray. And just today, I observed my prayer evolving is a fascinating way. Years ago, I prayed for things. I prayed for happiness for my family. I prayed for friends to get better. I prayed for forgiveness for me. 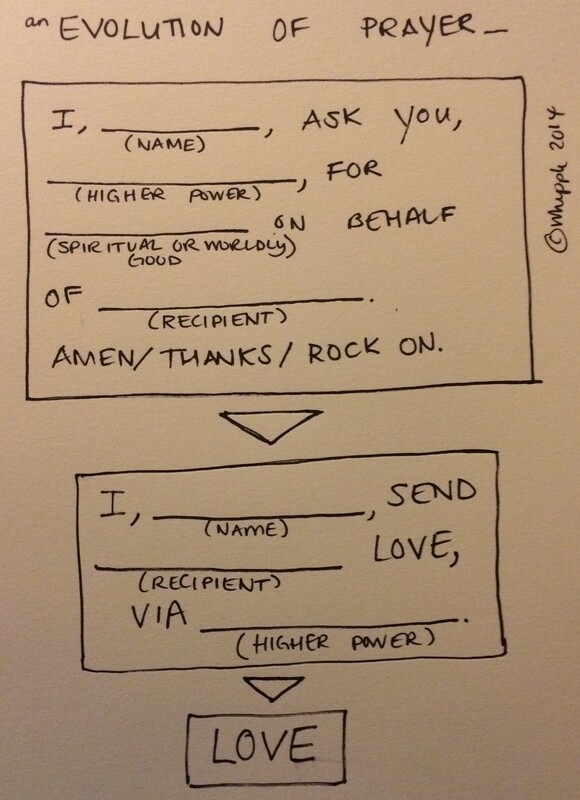 My prayer fit a typical format, one that you could almost write as a Mad Lib: I (Meredith) ask a higher power (God/Heavenly Father/universe) for some sort of spiritual or worldly good (forgiveness/health/happiness) on behalf of some recipient (myself/my family/my dog). But earlier today, a strange shift happened. I was sitting in meditative silence when I realized how very ego-oriented that whole approach was. In the past, I was praying. I was sending love. I was being the most loving person possible. But today, there was no I in it. Instead, I was love. I held love. I felt love. I would say that I became a better amplifier of the love that was already latent in me, but that would put too much of myself in it. Instead, the prayer felt more like simply radiating: Love. Love. Love. Love. But when I do put myself in a prayerful mood, I like this new way of approaching it. Less me, more you. Less ego, more existence. *love* this. i’ve come to a similar conclusion in my meditation: i am love. this has entered my daily practice. and my prayers over time have evolved into expressions of gratitude. because i do feel confident in trusting the past and having faith that the future will unfold correctly.